It seems early to already be down to just one undefeated team in the AFC, but the Bengals are playing like they could maintain that storyline well into November. They’re led by a defense who is hungry for more. 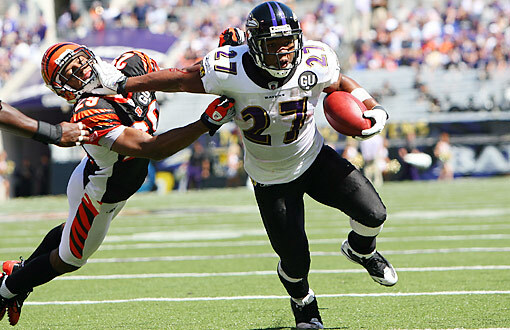 Aside from the Ravens making a game of it late during the fourth quarter, the Bengals have been almost untouchable. That defense is suffocating opposing quarterbacks and running attacks; while the offense continues to play simple, efficient football. With the NFL lockout finally behind us, football fans can finally turn our attention from the courtrooms and onto the field, where it belongs. In the coming weeks, I will rank the fantasy studs, duds and sleepers for each division. Today, the AFC North gets some time under the microscope. 2011 NFL Signings and Trade Rumors: Plaxico Burress Signs With Jets, Peyton Manning, the Chicago Bears and More! Plaxico Burress has signed with the New York Jets, Peyton Manning signs a $90 million deal with the Colts and the Chicago Bears have a new running back. What are the latest signings in the NFL? What names are in the latest trade rumor? Why will the Jets have one of the best receiving corps in football? The Sportsbank’s hottest column this year keeps getting hotter covering all the latest news from around the NFL!